Description: This is one of my favorite photos. It is so typical "Fox & Jane". Fox is being a scary monster and chasing Jane while she runs away from him and squeals and shrieks in delight. And then with Jane wearing a red hooded sweater, this shot totally looks like Little Red Riding Hood and the Big Bad Wolf! Fox/Wolf, same thing :) There isn't much else going on in the photo besides my kiddos in a dark garage, but I was able to use the moodboard color palette to bring it more to life and incorporated red, gray, woodgrain, cream, aqua, and blue. I love adding texture and shine with embellishments like sequins, buttons, and wood veneer shapes, and of course a dash of spray mist to draw the eye all around the page. Since I used a white background I stitched with dark gray thread around the border to keep the layout "contained." I love how the white Uniball Signo pen write perfectly on dark surfaces like the woodgrain paper I used here as a photo corner accent. Journaling says: This picture makes me think of Little Red Riding Hood being chased by the Big Bad Wolf, aka her brother Fox! 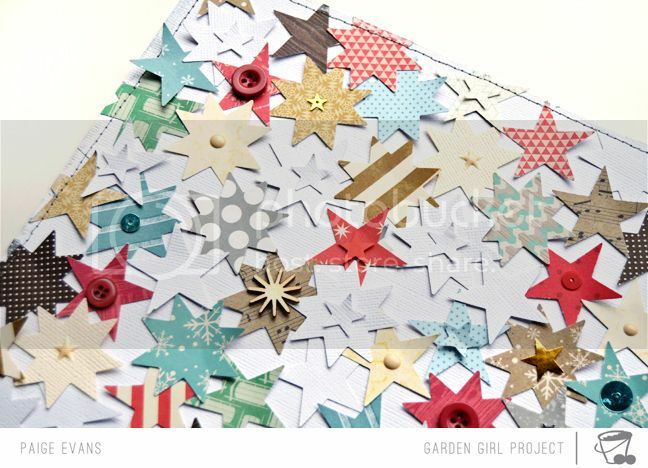 How to: Punch stars from white and cream cardstock as well as red, kraft, blue, gray, and woodgrain patterned papers. Adhere the stars on the top left triangle half of a white cardstock layout background. Embellish some of the stars with buttons, sequins, epoxy star stickers, and wood veneer starbursts. That's all for now! More scrappy goods to share tomorrow! Love love love this! LOVING the stars and that journaling is soooooo funny!!! Love your layouts, they are so colorful and happy. Beautiful layout! Totally loving all the stars on here. And that photo does look like Little Red Riding Hood..super cute! This layout is one of my favs! The colors are awesome and go so well with the photo. Plus, this is such a great picture! Love the awesome star design on this layout Paige, and such a cute photo! !